Atimpoku (E/R), March 21, GNA - The Omanhene of the Kwahu Traditional Area, Daasebre Akuamoah Boateng II, has called on traditional rulers to help promote tourism by making their festivals and land tenure system attractive to tourists and investors. He, therefore, urged the Ghana Tourist Board (GTB) to provide the needed professional guidance to traditional authorities to enable them to organise their festivals such that they could be relevant to the country's economic development. Daasebre Boateng was speaking at the sixth Eastern Regional Tourism Awards Night at the Akosombo Continental Hotel at Atimpoku on Saturday. 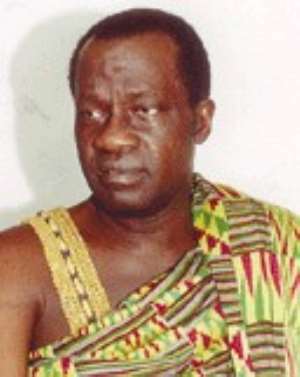 He called on the chiefs and people to come together and settle chieftaincy disputes amicably to attract tourists and investors to the area. The Omanhene called on stakeholders, including traditional rulers, district assemblies and developers to support tourism. The acting Deputy Executive Director of the GTB in-charge of Finance and Administration, Mr Charles Osei Bonsu, said the country's foreign exchange earnings in tourism rose from 447.83 million dollars in 2001 to 519.57 million dollars in 2002. He said tax revenue increased from 1,44 billion cedis in 1993 to 41.36 billion cedis in 2002 adding that tourism was the only sector that showed continuing growth in both number of projects registered and total investment cost. Mr Bonsu said the Eastern Region had rich cultural, historical heritage and ecological endowment. He said the Strategic Action Plan of the Ministry of Tourism and Modernisation of the Capital City, included plans to facilitate the development of potential tourism attraction in the region. Mr Bonsu the Odweanoma Hills, the Ramseyer Centre at Abetifi, the Oworobong waterfalls and the Afram River resort would be developed. Mr Bonsu said the Ministry would renovate the Eredec Hotel at Koforidua and make it a hotel training school and establish a Tourism Development Fund to mobilise fund to enhance tourism in the region . The acting Eastern Regional Manager of the GTB, Mr Sadique Braimah, expressed concern about the spate of road accidents resulting in broken vehicles on and indiscriminate defecation in some parts of the region could affect tourism. Award winners were presented with certificate and trophies. In the honorary division, Mrs Rita Marley, head of the Rita Marley Foundation, Konkonuru, near Aburi, was adjudged the Tourism Personality of the Year. Madam Doris Belinda Arkorful of the Linda Dor Group of Restaurants, won the Individual Initiative in Tourism Development, the Attraction of the Year, Konkonuru African Village, while the New Comer of the Year went to Modak Royal Hotel, Pepease-Kwahu. In the competitive division, Kwahu Pepease was adjudged the Cleanest Town/Village of the Year in the Eastern Region, Traditional Caterer of the Year went to "So Mei Sonka Chop Bar", Nkawkaw, Restaurant of the Year, Restaurant Sophisticat, Koforidua, while Host of the Year went to Mr Seth Asante, Volta Hotel, Akosombo and Housekeeper of the Year went to Ms Darling Biney of Little Acre, Aburi. Among the personalities who attended the ceremony included the paramount chief of the Yilo Krobo Traditional Area, Nene Narh Dawutey Ologo VI, the Queenmother of Akwamu Traditional Area, Nana Afrakuma and the President of the Ghana Hoteliers Association, Nana Adjei Twenin. 21 March 04.